Bing is the web search engine from Microsoft which was released in 2009. The main features of Bing includes interface features, media features, instant answers, local info, hotmail integration, integration with Facebook, Apple and Windows. At quintet we have programmers who are specialized in Bing integration. We are using Bing services for developing software as well as web applications. 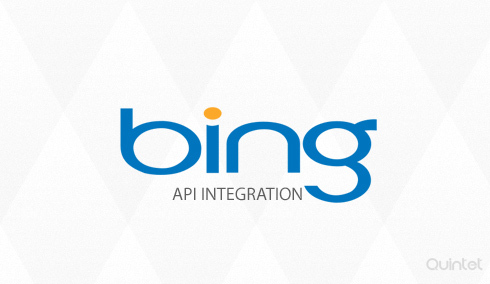 Making applications for media features, instant answers, local info, integration with Hotmail, integration with Facebook, integration with Apple and integration with Windows 8 certainly demands Bing integration. We are utilising the services such as search services, software services and marketing and advertisements services from Bing. We deploy on search services like Advertising, Dictionary, Entertainment, Events, Finance, Health, Images, Local, Maps, News, Recipe, Reference, Social, Shopping, Translator, Travel, University, Videos, Visual Search, Weather, Wolfram Alpha, xRank etc, webmaster services, mobile services, developer services etc. Our developers integrate the latest maps, images and locations into the applications we create by using the APIs provided by the Bing Maps Platform. Services like Windows Store apps, AJAX V7, REST Services, Spatial Data Services, Windows Presentation are also offered here at Quintet. We are proficient in geocoding, directions, search, imagery, localization support and other features like traffic incidents, pushpins, shape and shape layers, complex polygons, custom title layers, keyboard and mouse events, touch support, customizable navigation controls and elevation data. Our team can integrate speech capabilities with software and web applications. We can offer services like voice commands, speech recognition and speech synthesis with the help of Bing Speech API. We make it possible to open and navigate apps using the voice as well as transcribing speech to text and vice versa. Our developers can make it possible to receive text and deliver this automatically using the Bing Translator API. Easy access to robust, cloud-based, automatic translation between more than 40 languages using the Translator API can be done. We use the service in web applications to perform this language translation, and other language-translated operations to help the users who are not familiar with the current language of the website. Our team can integrate Search API in applications or websites using XML or JSON. We can implement custom search functionality to websites, apps and mash-ups. We offer the capability to request single as well as multiple source types with each search query with the service. Google is best known for it’s popular search engine. Google also sells other internet related services and products such as advertising, search engine, productivity tools, enterprise products and various other products. Quintet has an expert team which will help in Google API Integration. Yahoo! is globally known for its web portal, search engine and related services, including directory, mail, news, finance etc. At Quintet we will help you integrate Yahoo API's. We have an expert team that deals with Yahoo products and services. Facebook is one of the largest online social media marketing platforms with billions of users who are potential sources of traffic for your websites.Our facebook api integration experts are also ready to develop or upgrade your existing application with our simple and efficient api integration techniques.